Documenta Carelica is a portal of archival documents offering the possibility to use previously inaccessible materials relating to the territories of the former Ladoga Karelia and modern Karelia for research and other purposes. The portal has been developed and implemented by the staff of the National Archives of Finland and the National Archives of the Republic of Karelia. Technical support is provided by the National Archives of Finland. For the first time the portal provides open access to a wide spectrum of digitized archival documents of the National Archives of the Republic of Karelia on the history of Finland and Russian Karelia, Karelian language, culture, population, and economic development. The National Archives of Finland provides a number of maps and archival materials on the history of Karelia. Digitized materials and documents on the history and culture of Karelia from the two archives will be added to the website gradually. Scientific and cultural foundations and associations, state archives and archival services of other countries with open-access documents on the subject of the portal are invited to participate in the development and filling the information portal with scientific and reference materials. The duty of the National Archives is to ensure that records belonging to the national cultural heritage are preserved and to promote research based on them. The National Archives also guides and examines the archives and records management. The National Archives developed from the Senate Archives founded in 1816. In 1869 the Senate Archives was renamed to the State Archives, and in 1994 to the National Archives. Finland was governed from Stockholm during the era of Swedish reign and was annexed to Russia in 1809 as an autonomous grand duchy with a separate Finnish central administration. Records concerning Finland were transferred from Sweden to the Senate Archives which eventually began receiving material from other offices. National Archive of the Republic of Karelia is the largest and only repository of historical official documents of Karelian area. There are more than 2 million acts starting from 18th century till present time. The archive was founded in 1918 and operates under the ministry of culture. The main mission is to preserve documents of cultural history and popularizing them. Address: 185610, Rossija, Respublika Karelia, g.Petrozavodsk, ul. Kuibysheva 6-а. The records handle important events of Sortavala, Salmi and Kurkijoki areas. These three areas become part of Soviet Union after the winter war (1940). Today they are part of Republic of Karelia. The records of The National Archive of the Republic of Karelia were previously preserved in the Leningrad regional state archive in Vyborg. Arkistojen Portti is an co-operation of Finnish archives that offers information about the use of both paper and digitalized material. Not available in English. Erkki is a database of Finnish special Libraries and includes the library materials of The National Archive of Finland. The topics handle the history of Finland and its neighboring countries, publications about law, administration and social sciences, local history, genealogy, heraldy and sigillography. Europeana Heraldica has pictures of Finnish, Swedish, Norwegian and Danish coat of arms and sigils of officials from the Heraldica collections. FINNA is a search guide for Finnish archives, libraries and museums. Museoviraston Kuvakokoelmat is a web service for the Picture Collections of the National Board of Antiquities and the Picture Collections of Maritime Museum of Finland. 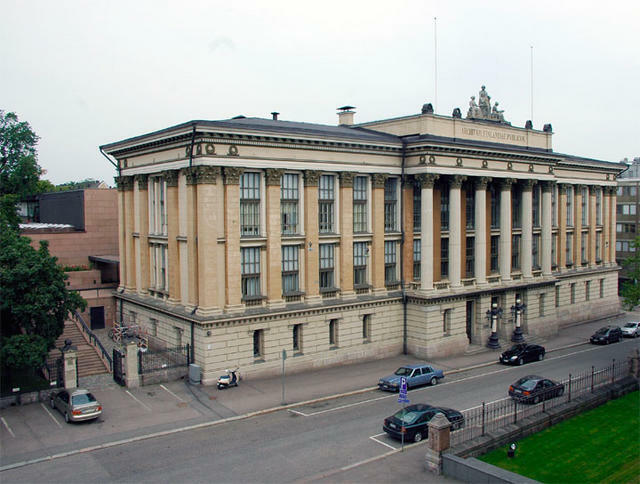 National Library of Finland is the oldest and largest scholarly library in Finland. KAVI's Library is the only special library for film literature in Finland. Their priority is the comprehensive coverage of the audiovisual culture in Finland, but the collection is international in scope. The Finnish Literature Society (SKS) promotes the advancement of a diverse Finnish culture. The Archives’ collections contain material on literature and cultural history. The collection includes manuscript material, letters, documents, photographs and sound recordings of authors and other literary figures and material on traditional and contemporary culture. The SKS library's collections contain Finnish and foreign research literature in the field of cultural studies: folkloristics, cultural anthropology, religious studies, ethnology and ethnomusicology. The Finnish Literature in Translation database contains reference information on Finnish, Finland Swedish and Sami literature in translation. Institute for the languages of Finland (aka Kotus) and Dictionary of Karelian language. Kotus is devoted to the study and language planning of Finnish and Swedish. They also coordinate the activities of the Saami, Romani, and Sign Language Boards. Karjala-tietokantasäätiön ylläpitämä henkilöhaku (Katiha BETA) lets you search people automatically from all parishes and registers in the Karelia area if they are not filtered. Helsingin ortodoksisen seurakunnan kirjaston tietokanta is a database of the library of the parish of Helsinki orthodox. Available only in Finnish and Russia. Salmi foundation available only in Finnish. Sortavala foundation available only in Finnish. Kurkijoki association and Kurkijoki related links available only in Finnish. The Finnish Karelian League was established by Karelian local governments, parishes and provincial organizations on 20th April 1940 - immediately after the Winter War. Today the Finnish Karelian League comprises about 400 Karelian societies operating in Finland and abroad. The vast majority of its 50 000 members are evacuees, but younger people also play an active role. Karelian culture association available in Finnish, Swedish, Russia, Viena, Livvi. Karelian language association not available in English. The Juminkeko Foundation is located in the Juminkeko building. They have one of the world's largest collections of Kalevala. The different translations of the Kalevala are in glass display cases. It is also possible to view Kalevala illustrations or to listen to samples of Kalevala readings in Juminkeko's own multimedia program Kalevala -treasure trove of knowledge. There is a Finnish, English and German version of the program. Some of the collection can be found in Juminkeko database. National Library of the Republic of Karelia page only in Finnish. Valaam Monastery and archive page in Russia. The exhibitions are only in Russia. The European Library – access to 48 European National Libraries and their collections. Explore the British Library – Catalog of British national library. Library of Congress Online Catalog – Catalog of United States congress library.